The faculty of the SLU Athletic Training Education Program and the Billiken Athletic Staff hosted a program in Sports Medicine for the Adventures In Medicine and Science (AIMS) Program at Chaifetz Arena. 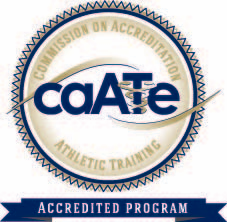 The students received hands-on instruction in techniques to learn more about athletic training and sports medicine. 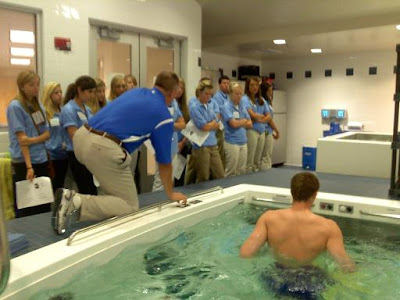 AIMS students observe as SLU Athletic Trainer Jonathan Burch conducts a Swim-Ex workout with Men's Basketball Student-Athlete Brian Conklin. The AIMS Program is an outreach program of the Saint Louis University School of Medicine. For more than 20 years, AIMS has offered summer workshops for high-achieving students who have an interest in becoming medical professionals. These experiential programs feature observations of live surgery, extensive study of human anatomy, and exposure to multiple facets of careers in medicine. The workshops are an outstanding way to help young people determine their future plans for study in college and beyond. Faculty for the programs include surgeons and medical professionals from across the community who conduct laboratories, lectures, tours and dissections. Students eligible for admission are entering their junior or senior year of high school, or freshman year of college in fall, 2010.